Out of all the reusable name badges we offer, Mighty Badges are one of our top sellers. 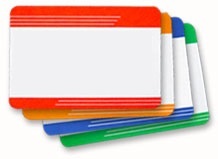 And schools, offices, stores and so many other places can benefit from using reusable name badges. Reusable products like Mighty Badges are easy-to-use and quick-to-assemble. And, if someone moves on from your company, it’s easy to pass along the name tag. 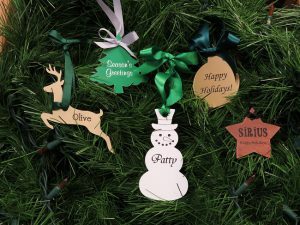 Many companies find the need to hire more employees during the holiday months or for different events. 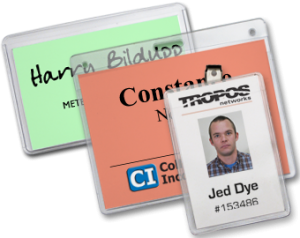 Using reusable name badges helps keep identification costs under control. This is where Mighty Badges save the day! Each badge comes in three parts: the metal backplate, the printable insert and the clear lens. The inserts are fully printable on an inkjet or laser printer and can be replaced as often as needed for new names, uses and different events. The clear, plastic lens snaps into place over the top of everything to hold the badge together. Choose from one of 10 sizes (nine if you need a printed logo) and a variety of shapes, including rectangles, ovals and squares. Print almost any text and graphics on the inserts and stack the three Mighty Badge pieces together for a professional name badge. Mighty Badges are easy-to-use, allowing them to meet multiple needs. You can customize them yourself with inserts, and you can get them right away. We also offer larger quantity discounts. 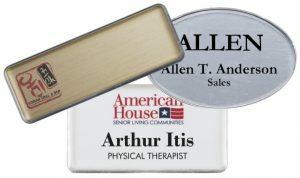 Using printable inserts is a perfect way to control name tag costs. Just print a new insert with each new employee or for different events. 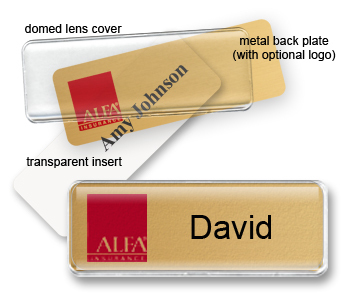 UV printed logos add class and professionalism to these reusable name badges. The brightly UV printed colors fit any logo or graphics need. And with a logo printed directly onto the metal backplate, all you have to do is print a new insert with a name or title of your choice. We know that name tags are not all created equal! And, there are endless ways to use each reusable name badge. But, no matter your name badge needs, remember to weigh all your options before making your final decision. We’re sure you’ll find a way to have a Mighty Badge™ save your day. From fundraising events to a formal gala, name tags are here to help all of your nonprofit needs. 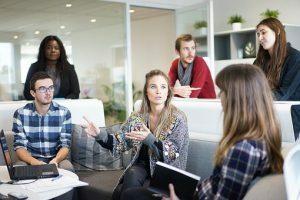 While most times a nonprofit has the same personal identification needs as other businesses, often these needs must be met differently. 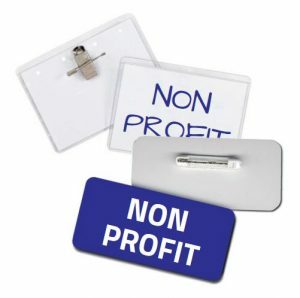 Whether it’s the cost of a name tag or just the efficiency of a reusable name badge, nonprofits are definitely in need of a bit of help. And, no one ever said any company or organization needed to break the bank for personal identification. No matter what you need, from name tags to ribbons, we’re sure to have it and at an affordable price. So, let’s get started on the items you need the most to get your cause or charity the recognition it deserves. 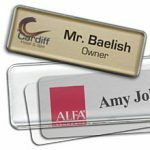 Using reusable name badges is a perfect way to keep any costs low and affordable. Whether your nonprofit has permanent employees or single event volunteers, these quality badges are sure to foot the bill. 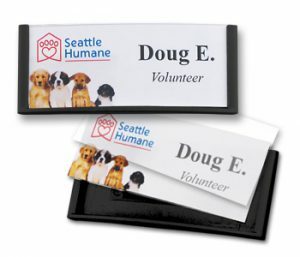 Use the printable inserts for Mighty Badges and Speedy Badges to customize your name tags for all of your needs. And, add a logo to make them a bit more memorable. And, if your volunteers want to keep their name tag to remind them of their charitable work, just remove the insert and let them take it home. Then you can reuse the frame or other pieces for your next event. Need something for a larger group of people? Take our badge holders out for a spin. Similar to reusable name badges, stuff each badge holder with a printable insert. And, use the colored inserts to help coordinate your event. From fundraising and volunteers to running an awareness campaign, these identification tools are perfect for every need. Name tags are just as relevant to nonprofit groups as they are to any other company. Attract donors and sponsors, gather and recruit volunteers and use their particular branding to promote awareness in your community. And, when attending events, add more than just a name to any inserts. Add titles, positions, logos, graphics and so much more. Use each name badge for multiple functions and different events. And stuff each badge with more than just the insert. Include a calendar of events or a little thank you gift. Make your nonprofit known by thanking any donors or volunteers and spreading awareness of your cause like never before with high-quality name tags! It’s the little things that count, right? And that applies to networking as well. Andrew Rigie wrote “Why Name Tags And Other Little Details At Events Matter” for Forbes at little less than a month ago. And, we love what he said about networking! The pressure is always high when you’re hosting a business networking event. Whether it’s a cocktail party for clients, an event to foster new business relationships, or a team building activity for your company, creating the right vibe and experience for attendees is a must. It doesn’t matter if you’re hosting a large event or small, it’s the little details that make a big difference. Think for a moment. What does good networking look like? How do people act while networking? What are their attitudes? Most people would agree that a good networker is sincere, friendly and outgoing, supportive and a good listener. It isn’t just about staying in touch. It goes beyond that. A good networker is someone you want to trust and be friends with. Providing high-quality name tags at networking events is a little detail that makes a big difference. They are worth the extra money. When we host networking events for hospitality industry professionals, we invest in high-quality name tags that stick to clothing using a magnet, instead of those with a pin. We’ve learned that people don’t always want to put a pin through their clothes and that using high-quality magnetic name tags elevates the perceived quality of the event. Remember that people need to find their name tag easily. You don’t want several people milling around a table for too long before they locate their credentials and pass to enter your event. Take into consideration how they will be looking for their name. Are they use to finding their first name or last? And organizing names by a company makes it just the much more manageable. 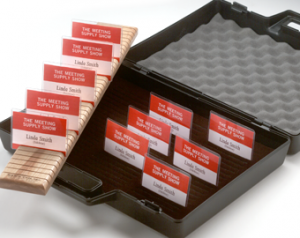 Use our Badge Holder Cases and Display Trays to make your name tags easily accessible. While badge holders and name tags are a great item to have on hand for any event, remember that you have other tools available. Try adding badge ribbons to each name tag for a custom look. Design ribbons to correspond with titles or positions at your next event. 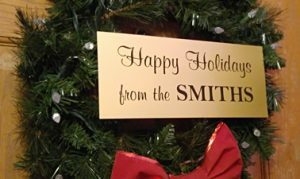 While we have over 50 titles available as stock choices, custom ribbons are also available. Choose the color and title that best suits your need. And, if branding is needed, most of our ribbons can have a logo or graphic added. People sometimes wince at the concept of name tags because they think they make the atmosphere cheesy or they’ve found ‘Hi My Name Is’ stickers stuck to the bottom of their shoes. But guests at our events make positive comments about the magnetic name tags, and they always want to take them home. Name tags just fit the bill with networking. 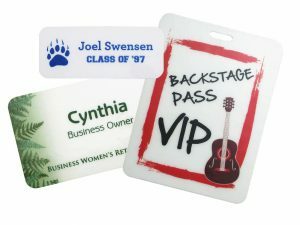 So, make your next event work even better with custom name tags and name badges.